Jorge Newbery participated in a real estate crowdfunding panel yesterday at the DisruptCRE conference on the 99th floor of the Willis Tower in Chicago. DisruptCRE is a first-of-its-kind commercial real estate / technology conference designed to connect disruptive ideas with capital and commercial real estate professionals. 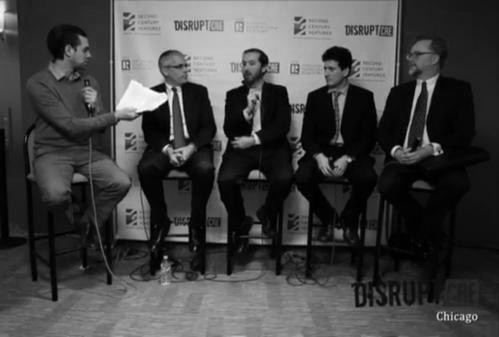 Newbery spoke on the Crowdfunding: A Tectonic Shift in Real Estate Investing panel. The panel was moderated by Kevin Guy, CEO of Real Liquidity and also included Gene Barash of Realty Mogul and Jordan Fishfeld of PeerRealty. In his response to where real estate crowdfunding will be five years from now, Guy added, “It’s exciting, this is transforming one of the last big asset classes.” Guy also shared his belief that real estate crowdfunding may someday be as accessible to investors as E-Trade, where investments can be made in the blink of an eye. “Long-term, I think we’re going to see crowdfunded shares trade like a stock,” Guy said. In discussing investor protection and when one might want to get their money out of investments, Fishfeld stated that investors might still be testing the crowdfunding waters. “Right now, I think we’re seeing a lot of short duration deals,” he said. “Investors can see how your investment performs over 8-10 months,” said Fishfeld. DisruptCRE included several other panels throughout the day including Meet the Disruptors: Innovators Driving Change, “Looks Like We Made It”: Graduating from your Co-Working Space, Inside the Box: Rethinking Space, Technology: Productivity Assets for property Management and A New Global Marketplace: How Technology & Innovation are Redefining CRE Brokerage. The seven hour conference concluded with a networking opportunity for attendees that included drinks and hors d’oeuvres.